How many times did you struggle with power point presentations? How many times did your slides appear powerful and catchy like an instruction manual of your boiler? How many times did you fall asleep during a meeting, because you couldn’t cope with the boredom of the presentation you were looking at? Perhaps you think that you can’t help it or you should hire a designer to create something nice. Well, as a designer I can say to you that you don’t need my help, because you can do it yourself. The good news is that you don’t need to learn a new tool, but you just need to change your approach. Just remember, a power point presentation is not a document: we can use Microsoft Word for that. 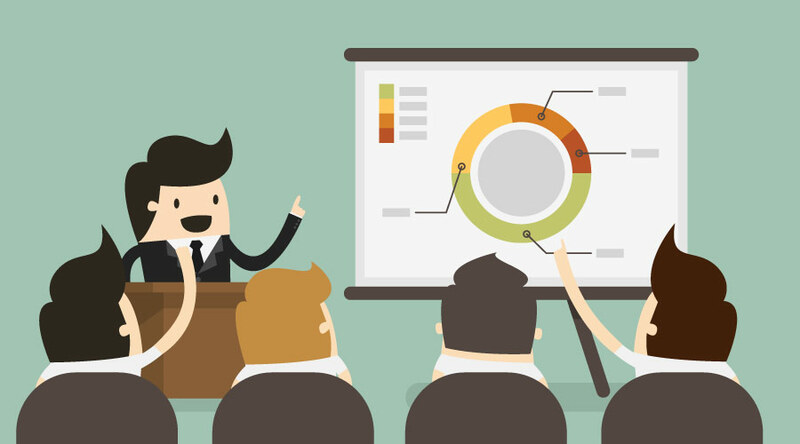 A power point presentation is a visual aid that strengthen your speech. It’s like a performance on a stage. People don’t want to hear you reading, so you don’t have to give them a copy of your speech. People want to see a great performance! So, let’s give them one! 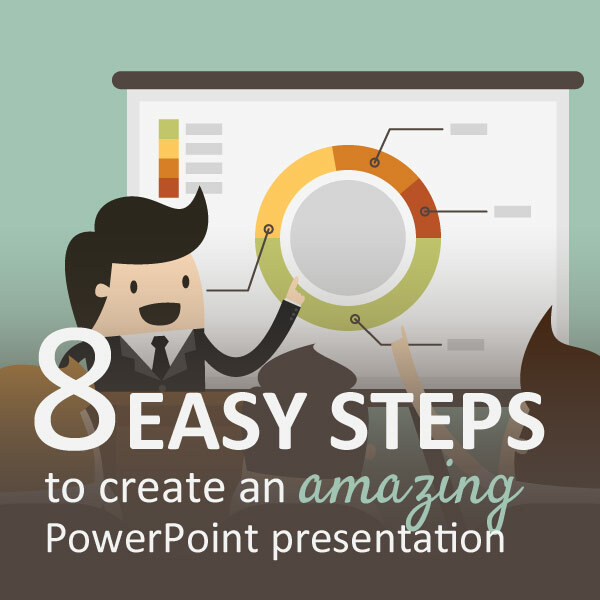 Here how to create an amazing power point presentation in 8 steps. 1- Lay down what you want to convey before getting started. Try to identify yourself with your audience: who are they? What do they need? And please, trying to avoid bullet points: they’re boring and take the attention away from the speaker, because people need to focus on what they are looking at. To avoid bullet points, spread your content in more than one slide. 3- Do not use templates. They all look like the same, do you really want your speech/performance looks like a million of speeches before? I didn’t think so. If you want to stand out from the crowd, build your own template. How? I will tell you how to do it, just keep reading. Where can you start to create a personalised layout? Technically, the creation of a personalised theme is less complicated than you think. Every layout will start growing alongside the developing of your powerpoint presentation, so every time you find the same kind of content you will use the same kind of layout. How can you choose them? Sometimes the logo of your company dictates that, but sometimes it doesn’t. To avoid the rainbow effect, try not to use more than 3 colours: the main colour (for titles or a background when you want to emphasise a concept), the secondary colour and a contrasting colour (to give emphasis). If you need any help at all, have a look at Colrd or Design Seeds, or type “colour palette” on Google or Pinterest. 5- Use fonts to create a hierarchy of contents or highlight something you want to point your audience attention on. But first of all, you have to be sure that everyone can easily read your slides. So, avoid small text or background that can compromise the readability. My advice is start with two fonts, one for the titles and one for the body; in the future you will be able to add a third font to give emphasis to a sentence or so. If you want to find some nice but still professional fonts, try with Google Fonts. The more simple your slides look, the better you will be able to catch your audience’s attention. Use only a few lines of text and let your images speak. Researchers have shown that people are more likely to remember images than text, so use this to your advantage. 7- Use only one image in a slide. 8- Use blank spaces to emphasise your concept. Your audience will appreciate that, especially if there are some designers in there. Just remember this: having a more powerful presentation will make your audience happier. Now it is your turn to try to create your amazing PowerPoint presentation, following these simple but yet very effective rules, and don’t forget to comment this post if you thing I’ve left anything uncovered or if you have any doubt. And if you are still struggling, just text me an email and I’ll be very happy to help you.